Struggling to find the information you need about a piece of Amish furniture on your phone? 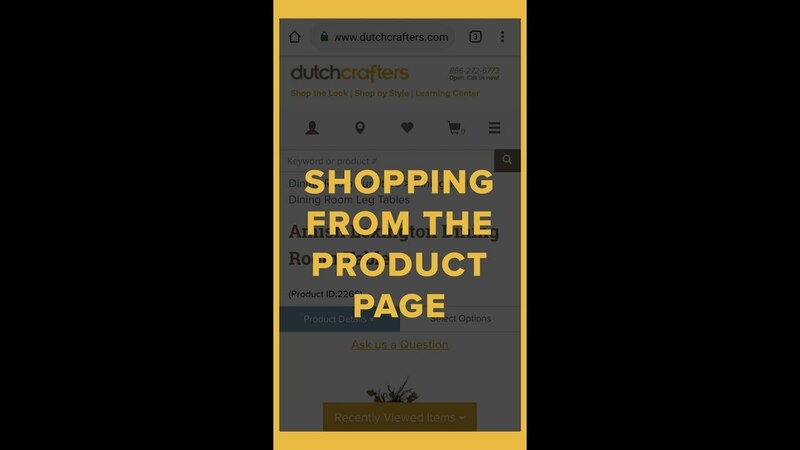 Here’s your guide to getting started shopping from the dutchcrafters.com product pages on a mobile phone. Visit a DutchCrafters Product Page like (https://www.dutchcrafters.com/Amish-Shaker-Dining-Table/p/42998) and follow along to find all the information you need to trust that you’re getting exactly what you want. DutchCrafters product pages give you the information you need for everything from product size and options available to your delivery estimate. And you’ll find photos, relevant videos, and even customer testimonials from customers that have purchased that exact product. We’re glad you found a product you like on DutchCrafters! The product page provides a wealth of information about our products. Click through our photos in the display window to see alternate views and details about the product. With DutchCrafters you’ve found the largest collection of Amish Furniture products online! So, if this product and its options aren’t quite what you want, our similar and recommended products sections help you to explore some of your options. On select products, buy as shown gives you a one-click option to select the product as shown in the image. You can then change your options from there or add it to your cart as-is. From this section, you can also check out the Shop the Look page for the entire set to let us do the matching for you. If you scroll down, you’ll find a product description in the Overview. We’re happy to provide unique guides and content that you won’t find anywhere else to help you select from all the options. Scroll further and you’ll find specifications, with sizing details and options. Our videos section will show you relevant videos about your product or category. It’s followed by a section about Build Time and Delivery. We’re proud to offer the simplest in Amish furniture delivery: $199 flat rate curb side delivery on your entire order, or $399 white glove inside delivery on thousands of qualifying products. In this section of the product page you can find the approximate build time for your piece, after which you’ll be contacted by a driver to arrange a day for delivery. If you order multiple products with different build times, they’ll be delivered together in accordance with the longer build time. The page menu at the top of the page helps you immediately jump to any section on the page or get in contact with a furniture specialist to help you with your questions and customizations. If you’d like to explore more products before making a purchase, the Add to Wishlist button allows you to save the piece to come back to later. Then you can always return to the category page through the breadcrumb navigation to continue exploring our selection. If you have any questions, don’t hesitate to consult our Learning Center in the header of the page, or call a Furniture Specialist! When you’ve decided on a product, click Add to Cart or Select Options. Happy shopping!